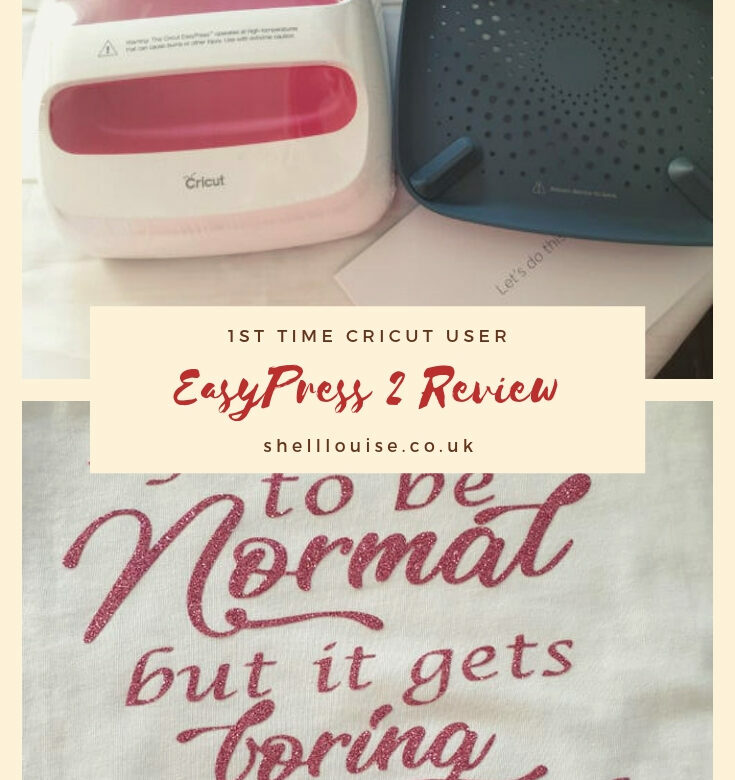 After getting to grips with the Cricut Maker, I turned my attention to the EasyPress 2. Again, this is my very first time using a machine like this so I can’t compare it to any other, but I can say, it’s brilliant and I’m very impressed! I have the 9″ x 9″ medium version. The EasyPress 2 is so easy to use I didn’t need to read the instructions, however, I did read through the booklet just to make sure I was doing everything right! It’s always a good idea to read the instruction booklet thoroughly whenever you buy a new product like this. In the box, there’s the EasyPress 2, a base to stand it on, an envelope containing the paperwork and a canvas bag in which to store it if you wish. Like the Cricut Maker, there’s a mini project for you to try so you can see how it all works. In the envelope, amongst the paperwork, you’ll find a green glittery Cricut logo and a leaflet with instructions to help you with the mini project. I switched the machine on and changed the temperature and time to the recommended settings for glitter iron on as shown on the instruction leaflet. For my first project, I asked my 11-year-old daughter, Ella, to pick one of her favourite quotes. I asked Ella rather than KayCee because I only had pink glitter iron on when I started the project and I knew she wouldn’t want pink glitter on her t-shirt! Sometimes I pretend to be normal, but it gets boring so I go back to being me. I’ve taken loads of screenshots for this tutorial so any beginners to the Cricut Maker, EasyPress 2 and Design Space should easily be able to follow along. I’ve covered some of my projects as I don’t want mine or Ant’s mum seeing the designs and spoiling their Mother’s Day presents! Above the canvas area, you will see a toolbar appear with the different settings needed to change your text. You can now click anywhere on the canvas and a text box will open. Go to the toolbar and click on the Fonts down arrow. If you want to use the fonts you have on your computer, click on the System button and choose your font. Your text will look like this on the canvas. Depending on the font you’ve chosen, you might need to rearrange the letters, especially if they’re supposed to be joined up. Click on the UnGroup button. This puts each letter on its own layer which means each letter can be moved independently. You can see each layer on the layer palette down the side. If you have eyes like mine, you may need to zoom in to make the letters bigger and make it easier to place them in the correct position. Just click the + button on the zoom until it’s big enough for you to see comfortably. Click on each letter in turn and move them into position. This is what your word will like once all the letters have been moved into place. Select all the letters by dragging a box around them using your mouse. Alternatively, you can hold your shift key down and click on each layer on the layer palette. Click on the Group button. This keeps the layers intact, but allows you to move the whole word together without disturbing the placement of the individual letters. Repeat the above steps until you have all the quote in position. With all the layers selected, set the size using the toolbar. When you’re happy with your design, make sure all the layers are selected and click on the Weld button at the bottom of the layer palette. You will now have just 1 layer with all the text on it. You will be taken to a preview of the mat with your design on and it will show you where your design is going to be placed when cutting. Glitter iron on is different to regular vinyl as it’s placed on the mat with the glitter side down. The back of the glitter iron-on isn’t sticky like vinyl. The glue on the glitter iron-on doesn’t stick until it has been heated. You have to remember to click on the Mirror button so your design will be mirrored to allow it to be placed on the t-shirt with the glitter side facing up. I use Design Space on my laptop for doing the design, but when I want to move over to the Cricut Maker I use the Design Space ap on my Samsung phone. It’s more convenient to use my phone than it is to move my laptop so all the following screenshots are taken from the ap. When the mat screen appears, look to the top left of the screen. It will say 1 of 1 and there’s a down arrow next to it. Click on the down arrow and as before on the desktop version, you need to make sure Mirror (for iron-on) is switched on. Choose the material by clicking on All Materials if Glitter Iron-On isn’t showing. Scroll down the list until you get to the Iron-On section. Select Glitter Iron-on from the list. I clicked the little star next to it so it will be added to my list of favourite materials. Attach your glitter iron-on to the Cricut mat. I used the standard grip green mat. Press the Load/Unload button when you’re ready. Follow the directions on Design Space. The Cricut logo button will flash once the machine is ready to cut. Now you just need to let the machine do its thing! Press the Load/Unload button to unload the mat and remove the iron-on from the mat. The tricky bit now is to remove all the excess iron-on. This is called weeding and whilst I usually enjoy weeding, I didn’t feel the same trying to weed the glitter iron-on! It’s quite hard to see the cut lines so you need to be careful and go slowly. I did a Google search to see if there were any tips to help make weeding easier with the glitter iron-on and I found that you can buy a Cricut Bright Pad Light Box. Something to keep in mind if you have real trouble with weeding. This is what it should look like when all the weeding has been done. It’s now time to transfer that glitter onto the t-shirt using the EasyPress 2. Set the temperature and time. If you’re not sure what temperature and time you need to use for your own chosen material, you just need to visit cricut.com/ep-settings. While the EasyPress 2 is warming up, get your EasyPress mat (or a fluffy, folded towel) and lay out the t-shirt. Make sure the mat or your towel has been placed on a strong surface such as a table rather than an ironing board. When the machine is at the correct temperature it will beep. Place the press on the fabric for 5 seconds. This removes moisture and heats the fabric. Never skip this step, it’s very important. Now position your design on the t-shirt with the glittery side facing you. Put the press on the design and press the Cricut button to start the countdown. If your design is bigger than the press, repeat the above steps until all of the design has been pressed. Turn the t-shirt over and apply the heat to the back of the design for 15 seconds. Turn the t-shirt back over and allow to cool slightly. Carefully peel the clear plastic from the design. Ella is delighted with her new t-shirt! A friend at the charity shop where I volunteer mentioned she had a hen night coming up and they all wanted personalised t-shirts. I’m going to take Ella’s t-shirt to show her tomorrow and see if she wants me to make them all for her!